What is one of the best things about winter? For one, preparing and eating all of the comfort foods you love so much. 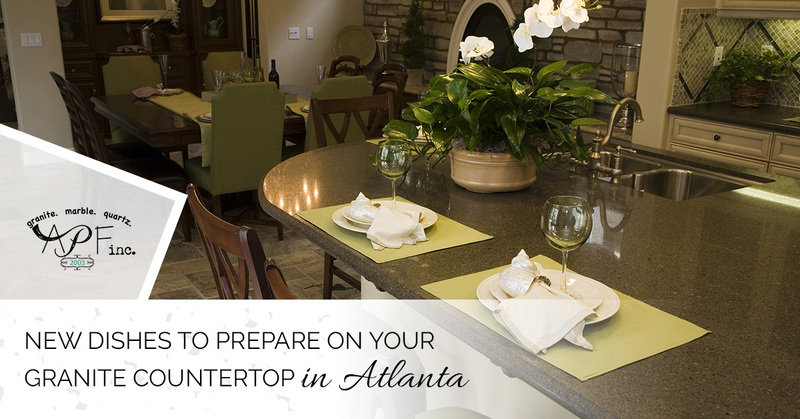 But what is even better is preparing all of your favorite foods on the new granite countertop you just had installed by A Polished Finish in Atlanta. While summer is for breaking out the grill and throwing barbecue parties, winter is the time of year you and the family gather in the warmth of your kitchen and prepare winter comfort foods. We are sure you have your favorite recipes and some of them probably include a great spaghetti recipe, a recipe for a succulent meatloaf and we are sure you have a killer recipe for chili. But you want to be careful, you tend to get stuck in a rut and keep preparing the same dishes over and over all winter. You should expand your horizons and learn a few new recipes for the family to enjoy. You might not strike a hit with everything you try to make, but at least you will have given something new a chance. And we are willing to bet that at least a few of these new dishes will be good enough for you to add to your recipe box. You are a fan of a very good casserole, they are great dishes after all. But you may have noticed you are in a bit of a rut and serving the same casserole week in and week out. You might vary the recipe a bit to change things up, but in the end, it is all basically the same. Traditional casseroles are typically some sort of pasta with a meat and a couple of cans of soup mixed in. We are thinking that your family would be pleasantly surprised eating a casserole made with chicken and wild rice. This dish is made with Swiss chard and an aromatic mushroom gravy and will have your family drooling at the table in anticipation. Traditional chili made with ground beans and beans is good, but it can get rather boring over time. If you want to serve a chili with flair, this chicken chili with tons of spice, sweet potatoes and bell peppers is sure to be a hit. For added depth to this great chili recipe, serve it with your favorite hot sauce and fresh flour tortillas. By February, you have probably lost track of the number of cups of chicken noodle soup you have eaten since September. If we were to guess, you have probably also had a cup or six of other types of soup including chicken and rice, vegetable, beef and barley, tomato and perhaps even bean and bacon soup. We aren’t arguing the fact these soups are good, they are all excellent soups. But if you are feeling adventurous and you have a bag of carrots taking up precious space in your refrigerator, then you should try your hand at carrot soup. Carrot soup is easy to make, very tasty and pretty good for you as well. It takes as long to say this recipe as it does to cook it. You might not think you like Brussels sprouts, we are guessing you have never tried them; or at the very least, tried them in a good recipe. Bringing all of these flavors together gives you a dish that you will love eating and your body will love you for eating it. You cannot make it through a winter without serving beef stew at least a few times. This version of beef stew is made with beef chuck, shallots, spinach and peas and will warm you from the inside out. It is also an easy recipe and doesn’t require you take hours out of your day to prepare. Pair anything with mac and cheese and you have yourself a winner. Pair a smoked andouille with a Cajun-inspired mac and cheese and you have prepared food fit for a king. Just make sure that when you are preparing these wonderful foods, you use a cutting board so you don’t damage your new countertops. If you need new countertops, contact A Polished Finish.